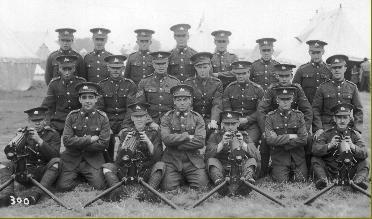 There were two Regular Army battalions of the Lincolnshire Regiment between the two World Wars, the 1st and the 2nd. There was no 3rd battalion, but there were also the 4th and 5th battalions--Territorial Army units, comprising civilian volunteers who trained for one or two evenings a week and sometimes at weekends. Men in the Territorial Army were known as "Terriers", or sometimes--jokingly--as the "Saturday Night Soldiers". Many of the men in the Terriers had joined with their friends from work, the pub or perhaps even the same football team. Some were brothers. It was the thing to do--a bit of a laugh. The annual highlight was the fortnight's summer camp, usually held at a different place each year. Training was not particularly rigorous. There was plenty of off-duty time at the summer camp and it was seen as a holiday. In fact, some men had joined the Terriers just so that they could go on the annual jaunt to the camp, for in those days it was probably the only holiday that many of them were likely to get. 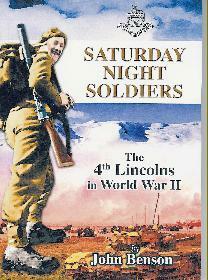 There is now a book about the Saturday Night Soldiers from Lincolnshire. Written by John Benson (co-author of "All the King's Enemies") the book traces the history of the Territorials in the 4th Lincolns from before the war until 1946. There are 215 pages, including the full Roll of Honour and an index, 110 black & white photos and 12 maps. Click here to find out how you can order it. Machine-gun platoon. The machine-guns were taken away in 1938, to be replaced by mortars. Other changes in the same year were that puttees no longer had to be worn and the men now marched in threes rather than fours. 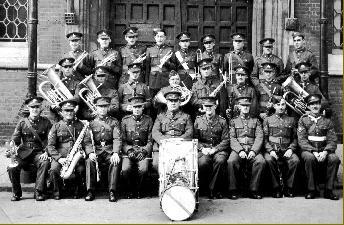 Some of the men had joined the 4th Lincolns so that they could be in the band, seen here outside the headquarters at the Drill Hall in Broadgate, Lincoln. An officer and one or two senior NCOs were attached to the battalion from the Regular Army. The other officers tended to be local professional or businessmen. They did their best, but they were poorly-equipped. Although the men were younger, the pre-war Territorial Army was in many ways similar to the Home Guard which was formed during the war. Nevertheless, Whitehall--quite unfairly and unrealistically--saw TA units as fully able to take their place alongside the Regular Army.